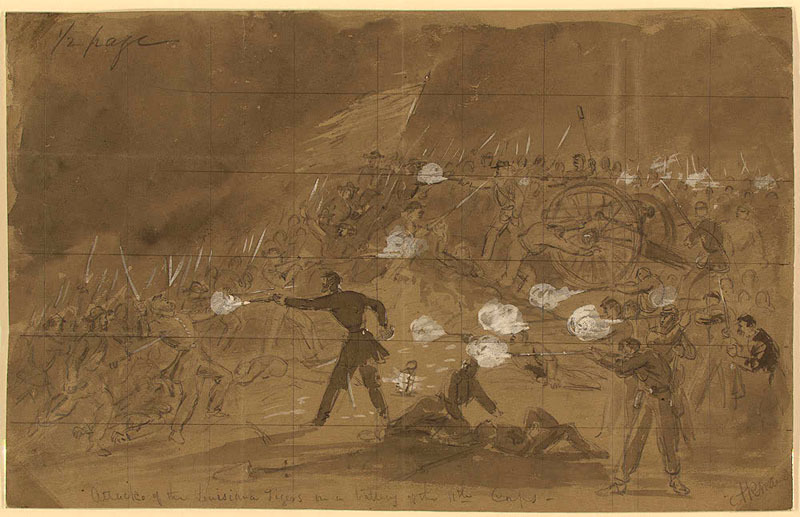 Above, Waud captures a cavalry unit on reconnaissance at Raccoon Ford. His written account (cited above and below) and the wood engraved translation of his sketch appeared in the October 3, 1863 edition of Harper’s. 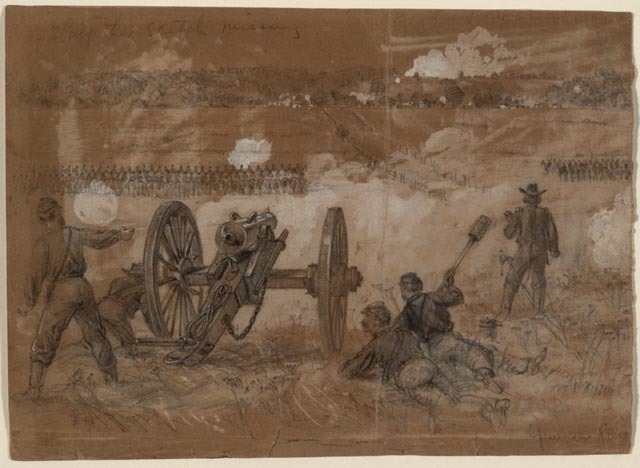 The cannon group that dominates the sketch appears bottom left on the printed page. Wars and conflicts generally mean good business for publications and outlets like these. Above, an auspicious launch for DianShiZhai Huabao, a Shanghai pictorial (previously discussed) which in its first issue (1884) describes a battle in the Sino-French War, then raging; a matter of pronounced public interest. The class had been assigned Baudelaire's The Painter of Modern Life as a reading. That essay, written in 1860 and published in 1863, pairs nicely with Manet's Olympia (1863), as the painting captures the frank engagement with the present for which the poet called, and was experienced as such an affront to the civilizing pretensions of art. "Any man," he said one day, in the course of one of those conversations which he illumines with burning glance and evocative gesture, "any man who is not crushed by one of those griefs whose nature is too real not to monopolize all his capacities, and who can yet be bored in the heart of the multitude, is a blockhead! a blockhead! and I despise him!" This imperative–to engage what is, who is, how things look–suggests journalistic output. But other modes emerged, too. There are connections to be drawn between American illustrators and American painter-reporters of the Ashcan School, for example in the person of William Glackens. Glackens traveled to Cuba to cover the Spanish American War for McClure's in 1898; later he focused on his painting career, but not without an editorial edge. The Shoppers (1907) above, suggests a point of view on the Gilded Age. John Sloan, another of the Ashcan Clan, worked for Philadelphia papers but painted New York. Sloan's political interests led him to work as the art director at The Masses, a socialist publication. His Ludlow Massacre cover is among his best known works. But let's come back to Baudelaire and Guys. Baudelaire credits the illustrator with prodigious powers of observation, thoroughly attuned to his modern moment. By 'modernity' I mean the ephemeral, the fugitive, the contingent, the half of art whose other half is the eternal and the immutable. Every old master has had his own modernity; the great majority of fine portraits that have come down to us from former generations are clothed in the costume of their own period...This transitory, fugitive element, whose metamorphoses are so rapid, must on no account be despised or dispensed with. Toward the end of class we posed questions of our own period. What would the Constantin Guys of our time notice? Which customs and costumes, which artifacts, what speech, what ways of holding oneself, which contemporary textures, would our illustrator note and record? The beginning of that discussion focused particularly on technology: its manifestations and uses. Such an observation might have credibly been offered in any of the last 100 years. Which technology, what manifestations, and which influences upon contemporary life? Secondly: what's behind the half-and-half formulation of the now and the ancient, the "contingent" versus the "immutable"? How shall we parse that equation in today's terms? I invite comment on these questions. With more time to reflect, what do you really think about this? What might be the difference between a superficial answer–iPhones!–versus a more searching one? Presently, a second installment which extends the technological and cultural dimensions of our discussion of visual reporting, from Alfred Waud to YouTube. Constantin Guys, Reviewing the Regiment, inkwash illustration, n.d.